-As of November 2013, Mercedes had already sold more of them than in all of 2012, and about half of those are the very pricey G63 AMG models. Get this: In the States, the G63 is now the best-selling AMG product. -The trucks 37" tires can be centrally inflated or fully deflated with the help of four 20-liter air tanks and a giant compressor. Zero pressure to a roadworthy 2 bar happens in 20 seconds. 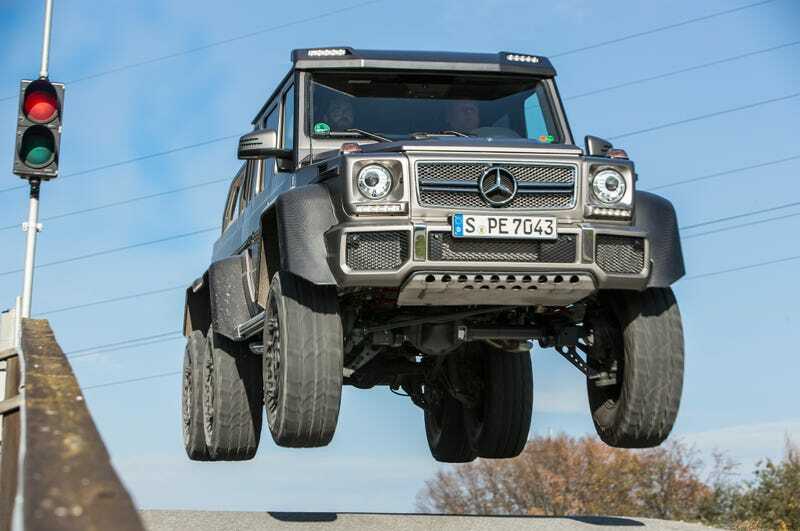 -The 6x6 weighs a touch more than 9000 pounds (up from 5876 for our last standard G63), yet Mercedes claims this monster can hit 60 mph in fewer than 8 seconds. -Not only is the ground clearance way up compared to the regular G-Class' 8 inches, but fording depth is up from 24 to 39 inches. In fact, every off-road metric is hugely inflated, from approach/departure angle (36/27 degrees for G63, 50/45 degrees for 6x6) to breakover angle (21 degrees versus 50). I'VE ALWAYS WANTED A 3 AXLE TRUCK. THIS IS THE STUFF OF CHILDHOOD DREAMS. Although I'd still take the dodge of this any day.